Summary: Fresh life from the dead stump of Jesse — the royal line of Israel was only a memory in the minds of most when Mary came to visit Elizabeth, carrying the One promised by Isaiah. Consider this growth in unexpected places — a green shoot from a dead stump; a woman too old to conceive now six months pregnant, greeting a virgin, pregnant also — God working in His own ways to accomplish His own purposes. The Virgin’s Son embodied the fullness of the Old Testament prophecies and His birth heralded the advent and the impending fulfillment of the New. In His meekness and poverty, He brought heaven’s riches to earth to lavish upon those who are poor in spirit, humble before God, and seeking His righteousness. 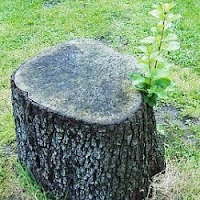 Sermon Text: There shall come forth a shoot from the stump of Jesse, and a branch from his roots shall bear fruit. And the Spirit of the Lord shall rest upon him, the Spirit of wisdom and understanding, the Spirit of counsel and might, the Spirit of knowledge and the fear of the Lord. And his delight shall be in the fear of the Lord. Audio: Click to hear the MP3 of The Shoot of Jesse’s Stump, preached to the saints of God at Saint Matthew Lutheran Church, Ernestville, Missouri. See Aardvark Alley for more on The Visitation of the Blessed Virgin Mary. Also check out O Radix Jesse, one of a series of Advent meditations based on the O Antiphons and the hymn O Come, O Come, Emmanuel.